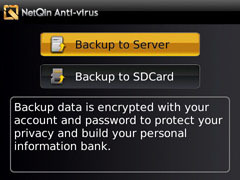 NetQin Mobile Antivirus (BlackBerry) - Supported by a Cloud-security model, NetQin Mobile Antivirus is designed to protect BlackBerry devices against viruses, malware and spyware. Featured in the Anti-virus is the availability of scanning and deletion, with Cloud Computing Technology and real-time protection. Also included is a new Anti-lost feature that helps to locate the phone and protect privacy once stolen or lost. The full cross-server contacts backup system also provides full protection for users' data. · The Anti-virus feature keeps your device away from spyware/malware/virus so that both your device and your privacy will stay safe. 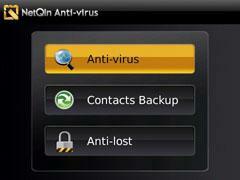 The Cloud-based scan ensures that the application effectively identifies and eliminates viruses. · You may backup your contacts to the server or to the SD Card by using this feature. If you backup to the server, NetQin will keep them for you so that they will never get lost. With a Netqin account, you can easily backup/restore your contacts seamlessly between different operating systems, such as BlackBerry, Android, Symbian. · Anti-lost helps to maximize losses and protect your privacy when your phone gets lost or stolen with the following sub-features: Remote locate, Remote delete, Remote lock and Sound the alarm. By sending remote commands to the phone, you can locate where it is, delete all data on it, lock the phone to prevent illegitimate use and sound the alarm to spot the thief.